Citrus are easy and rewarding plants to grow in the garden or pots. Lemons, limes, oranges, mandarins, grapefruits, cumquats as well as the more exotic varieties all grow well with a minimum of fuss. The vitamin rich fruit can be picked over a long period, making them ideal for the home garden, and citrus are ornamental as well as practical, making attractive shrubs or trees with dark glossy foliage and fragrant flowers during the warmer months. In frost free areas of Sydney, you can plant citrus anytime of the year. Naturally watering is all-important when establishing any plant and citrus are no exception, preferring deep waterings. When planting in ground, make a wide, shallow hole about 30-50cm wider than the container. The roots should be gently teased with a garden fork or bare hands to encourage them to grow out into the surrounding soil, and the bud union (the knee like joint where the tree has been grafted, to help avoid root rot problems) kept well above soil level, just as it was in the pot. Naturally some enriched planting mix (All in One Compost and/or cow manure) should be added and firmly pressed in, and the plant thoroughly watered. Use Tree Mulch to finish, but keep it an inch or two off the trunk. When planting in pots ensure good drainage and use “Pot Power” Ultra-premium potting mix. Yes, it costs more but it’s much better for the plants and lasts up to 5 times as long as other mixes, so is far cheaper in the long run. Again, Tea tree mulch in pots helps prevent drying out and suppresses weeds. We use it on all large pots at Honeysuckle Park Production Nursery. Citrus trees need little pruning with the possible exception of certain lemons that need to be shortened from time to time, so as to keep the plant at a manageable height. Note that in the past year or two many “dwarf” (up to 2m or so) varieties have been introduced, and are sensational! It is also important to rub off any shoots that appear below the bud union, and to keep mulch and compost away from the trunk, to help avoid collar rot and other fungal problems. Citrus also need regular fertilising to produce quality fruit, so it is important to follow a reasonably regular routine. The best times for giving a ration of "Citrus Food" are early spring and late summer, and trees should be well watered before and after fertilising to avoid burning. Under no circumstances should such a fertiliser be used on a newly planted tree in ground and NEVER on a citrus in a pot, unless you have a death wish for your plants. It is timely to remember that directions should always be closely followed with all fertilisers and chemicals. A well grown, mature citrus tree should only require about 500gm of chemical fertiliser each year. This can be supplemented or partially replaced by quarterly applications of Organic Life, etc. but again remember not to heap anything around the trunk. Regular liquid feeding every week or two with Harvest is also highly desirable, as citrus are gross feeders with massive appetites! Fruit drop: Is usually associated irregular or uneven watering, or with excessive fertilising, particularly when fruit are forming. 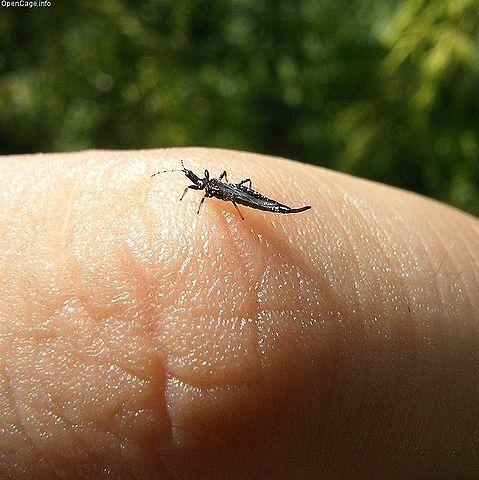 Stink Bugs: (Also known as 'Bronze Orange Bug' )During the warmer months the infamous "Stink Bug" thrives. Starting off translucent green in spring, then orange, it is in the adult black form that it does most damage as it attacks new growth causing the plants soft new stems to go black and the plant to lose vigour. As well as being unsightly and smelly, these cockroach-sized critters will also empty their acidic bladders to repel predators. That liquid can be as strong as Hydrochloric acid and can be very dangerous on sensitive skin, with quite severe burning if not washed off immediately. Please carry out a weekly search and destroy mission! The easiest organic way to get these pests is in the middle of a hot day as they shelter down the tree. They can then be knocked down with a stick and trodden on, or collected (like picking up dog poo), and left to cook in a plastic bag. Alternatively Conquer (low toxicity to all mammals including your pets) will kill them quickly, but don’t use it when bees are foraging. Whichever method you use, please wear gloves, long sleeves, glasses/sunglasses and hat. Dressing up like a scuba diver would also be good, but may be taking things to extremes, and the neighbours will start to talk. 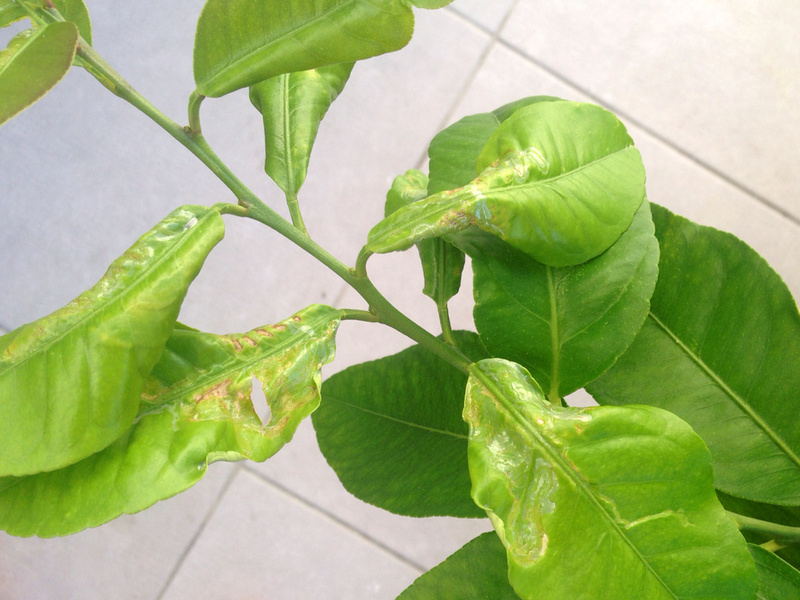 Aphids, thrips, soft scales, Leaf Miner & baby caterpillars: Can all be treated with the incredibly safe, cheap and environmentally harmless Eco Oil, which if sprayed every week or two will keep almost all Citrus baddies under control. 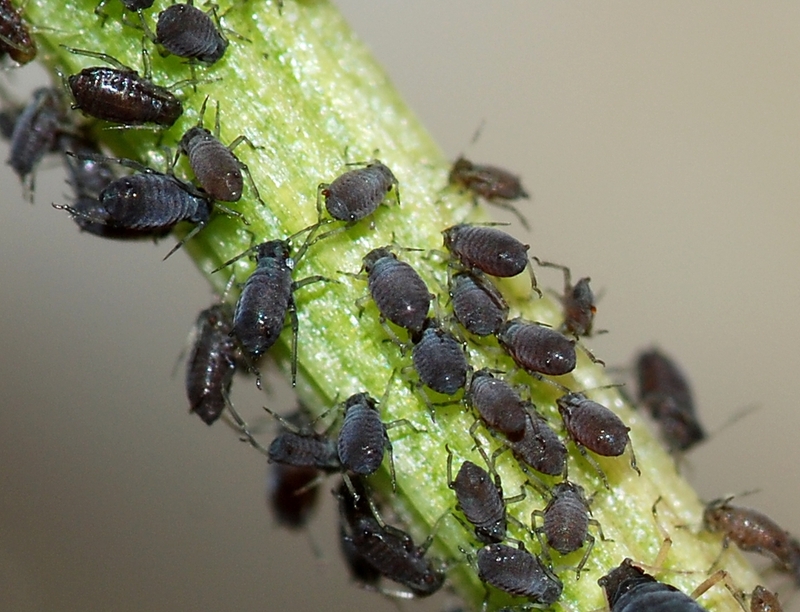 Eco Oil doesn’t damage bees, ladybirds and other beneficial insects, and will even give juvenile Stink Bugs a major headache from which they may not recover, (though it is not especially effective against the adult Black Stink Bugs). Larger Caterpillars (including “Spitfires”! ): Dipel or Success are both very low toxicity sprays for citrus, veggies and herbs. One call also one of the best organic insecticides of all, called "Treadonit"; simply pull the caterpillar off the plant, throw it on the ground and Tread-on-it! 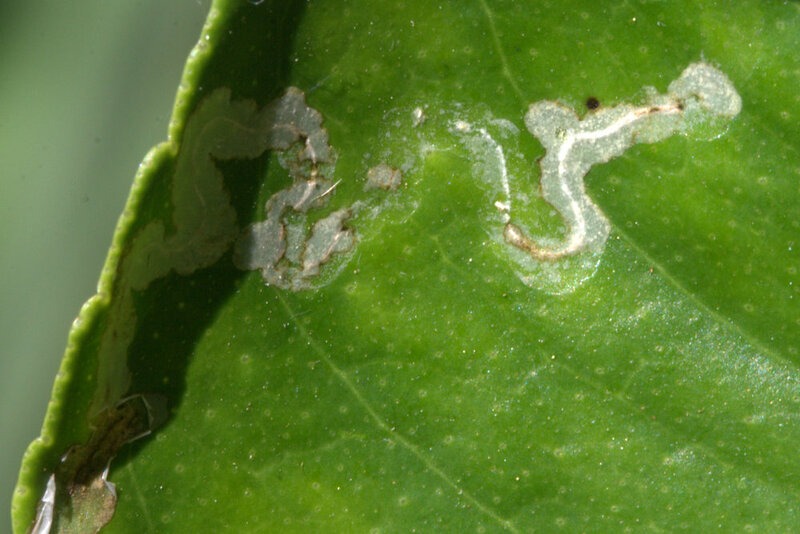 White Louse Scale (and other hard scales): In winter each year it is prudent to spray your citrus, roses and deciduous trees with Lime Sulphur, to help eradicate the white louse scale that can accumulate on the trunk and stems, and is immune to oil based sprays. Lime Sulphur also helps kill any overwintering fungal spore, so should also be sprayed in winter over the aforementioned species and around the ground of your citrus, roses and deciduous trees. Other problems besetting citrus: Bring a sample (in zip-lock bag) to Honeysuckle Garden for free diagnosis.